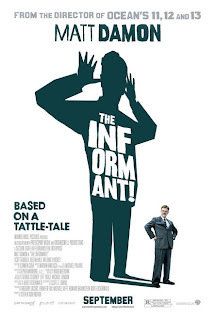 Cam's Cinematic Episodes: Film Review - THE INFORMANT! 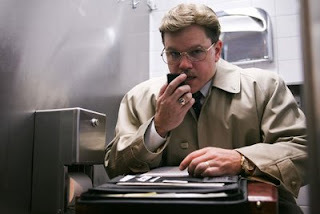 Film Review - THE INFORMANT! Almost precisely a decade ago Matt Damon, in The Talented Mr. Ripley, disappeared into the chameleon-like skin of a sociopathic serial killer who was intent on climbing the social ladder to wealth and high esteem, using words and sharp cunning to gain supremacy over his clueless victims. 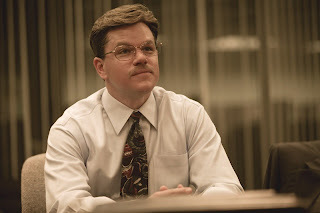 The genius of the performance was how it allowed the hungry young performer, still fresh off of being drafted into the Big Leagues with Good Will Hunting, to portray the most gifted of actors, a virtuoso master of drawing emotional responses from his audience through an intoxicating mixture of calculated subterfuge and inspired manipulation. 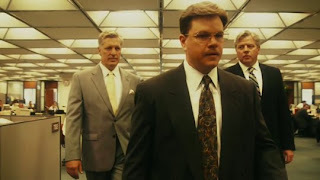 One has to wonder if there was a conscious inkling to re-explore that character-type lingering in the back of Damon’s cranium when he chose to tackle the role of Mark Whitacre, the paunchy, goofy-moustachioed corporate executive- turned-whistleblower, in Steven Soderbergh’s frequently too cool-for-school absurdist comedy, The Informant! Like Ripley, Whitacre is a deceptively affable and non-descript blank of a man who attempts to construct his own larger-than-life personal narrative by confusing and misleading those around him. 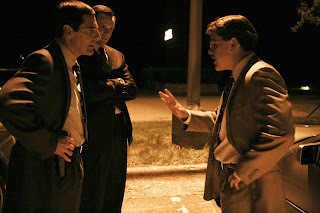 He bases it on the crowd-pleasing novels of Michael Crichton and John Grisham, and that is what gives the film its own unique mad-ball spin. Based on a true story — which informed the best-selling book by author Kurt Eichenwald — The Informant! doggedly follows the often bewildering exploits of Whita cre, an Ivy League-educated biochemist, who maintains a successful, if mundane, existence as a family man and top-ranking VP of the Archer Daniels Midland group, which specializes in the manufacture of corn-based products. 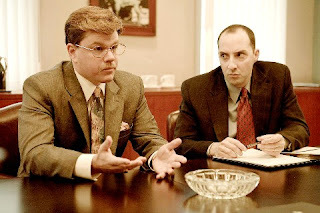 However, as fate would have it, in the midst of a crisis involving a new virus strain depleting the company’s lysine stock, the shlumpy exec casually reveals to his superiors that he has received extortion demands from a rival Japanese corporation, who claim responsibility for the contamination. Soon the FBI is involved, and the ultra-cooperative Whitacre, drunk with delusions of grandeur, decides to turn informer against his long-time colleagues by cheerfully divul ging the details of a Byzantine price-fixing scheme to the special agents working the case, Brian Shephard (Scott Bakula — wonderful as a study in comic aggravation) and Bob Herndon (Joel McHale). Yet, as the scope of Whitacre’s story deepens, and the complexities of the situation mutate and multiply, the players, not to mention the audience, become trapped in an often incomprehensible web of false information and lunacy. 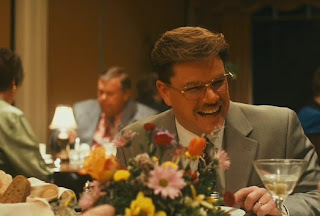 There’s a tangible aura of fidgety anxiety through much of The Informant!, as Soderbergh, a gif ted talent unproven in the comedy arena, constantly battles to capture the dry zany tone which the Coen brothers regularly trade in, but is unable to ramp the movie’s energy level up past a casual amble. This is a film that cries out for screwball-level pacing to properly keep up with Whitacre’s intensely escalating tall-tales, but instead it just casually strolls, sometimes agreeably, often lackadaisically, from scene to scene without any sense of rising tension. Soderbergh’s aesthetic choices are also puzzling and undercut the story with insecure tongue-in-cheek flourishes. Despite being set in the earlier part of the ‘90s, the characters inhabit a world decorated in ‘70s decor, and the cinematography intentionally paints the characters flesh-tones to m atch the copious amounts of wood-paneled wall units and furniture dominating almost every set. Perhaps it’s the director’s intention to capture the distinct flavour of the period’s paranoid thrillers, but instead of setting an evocative tone it feels distracting and precious. Likewise, bright splashes of neon Exploitation-style graphics and, most gratingly, Marvin Hamlisch’s obnoxious score, which plays wacky circus and spy theme music over moments of “humorous” tedium — a technique which is amusing early on, but grows infuriating as The Informant! meanders into its second act stretch and beyond — do little more than provide unwelcome jokey commentary upon the dense unfolding events. It’s frustrating to attempt to derive any sense of emotional fulfillment or intellectual engagement from a film that goes out of its way to deflate itself every time we become actively involved. 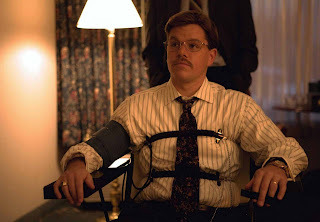 Nonetheless, despite Soderbergh’s hamhanded tactics, The Informant! is not without its gifts thanks to the jitter y charms of Damon, whose Whitacre is a brilliant tragicomic creation, spouting a daffy ADD-fuelled stream of bizarre non sequiturs in his wittily unreliable narration. Surrounded by a gifted cast of comedy- trained actors playing it straight, the actor’s contagious relish in hiding inside this frumpy nerd-savant is astonishing to behold. It’s truly a kick to watch this venerable leading man let his go-for-broke character actor freak flag fly. Damon is the life force of Soderbergh’s flawed effort, a dynamic (if impenetrable) force of nature that consistently pulls the film back from the brink of quirkiness-for-the-sake-ofquirkiness monotony. Indeed, the most curious irony of The Informant! is that, like Mark Whitacre himself, it overestimates its own cleverness in the face of great odds, and to regrettable detriment. Mr. Ripley wouldn’t approve and, unfortunately, I just can’t quite either. *Originally printed in SFU's The Peak: Sept 28th, 2009.